Wishing all of you a Very Merry Christmas, Happy Holidays and Joy in the coming New Year! I hope you are able to enjoy time with your family and friends and take a much needed break to have fun with the ones you love. Inviting friends and family into our homes is a joyful event, but sometimes the stress of preparing the house beforehand is overwhelming. What can we do to make entertaining less stressful? Here are my tips for planning a successful party. Try to do as much as possible well in advance of the event. Start by making a list of what needs to done. If you’re hosting a large gathering, make a list 4 weeks in advance of the event, prepare the guest list and send out invitations. Plan the menu as far out as possible and don’t forget the beverages. Make a shopping list and include all items like paper goods, decorations, party platters, and drinks. When planning the menu, make sure to plan the cooking schedule, what can be made ahead and frozen, the day before, and that day, and what can be bought already prepared. Do you need any equipment for your party? For my larger gatherings, I bring out these cocktail tables I bought years back HERE, they have been a huge help in giving my guests a place to gather with food and drinks. They are way more economical than you might think, and pay for themselves over renting the equipment. The tablecloths HERE are super economical as well, and a bit of silk ribbon to wrap the tablecloth makes a beautiful presentation. Plan the layout of the room so your guests can enjoy a smooth flow around the eating area. Focus on the rooms that will be used during the party. Those are a top priority, the other rooms in the home are less important. Start with the foyer and work your way back to the other rooms. Remove all clutter and give your guests plenty of room to move freely around the home. Polish your silver well before the event and set up serving platters, trays, and chafing dishes. The tablecloths I used are 150″ long and very economical HERE, at this price they are almost disposable but way better quality, reusable, and wash easily in the machine. I also use plastic tablecloths underneath to protect my table from spills, your guests will never know. Plan the music for the party by getting your playlist ready. If your party in during colder months, plan to clear out your closet to have ample room for coats. Clean the house days before the event. Don’t wait until the day of the party to tidy up, mop the floors, and dust. You’ll have so many other things to do that day…focus on doing as much as possible beforehand. Add extra seating. Since I was using the dining room table for food, I brought the chairs from the dining room into the family room for more guests to gather. Get help!! Your family and friends want to help you! Accept their help! They want to bring food to your party, they want to help you organize your home…graciously accept their offer! Prepare your finishing touches in advance, like floral arrangements to make the home more inviting. Lastly….enjoy your party!! You’ve spent a long time preparing to make sure no detail was overlooked…with the proper planning your party will be a huge success!! Merry Christmas and Happy Entertaining my friends. I appreciate your support of my little blog, thanks for visiting, and come back for more decor inspiration. If you enjoyed this article, please tweet, pin, and repost. For more inspiration follow along on Instagram HERE. You can also follow along on Pintrest HERE, and Twitter HERE and subscribe to Happy Haute Home to get bi-weekly inspirational posts delivered to your inbox. Such great advice! I used to entertain a lot and I wish I had known you then! 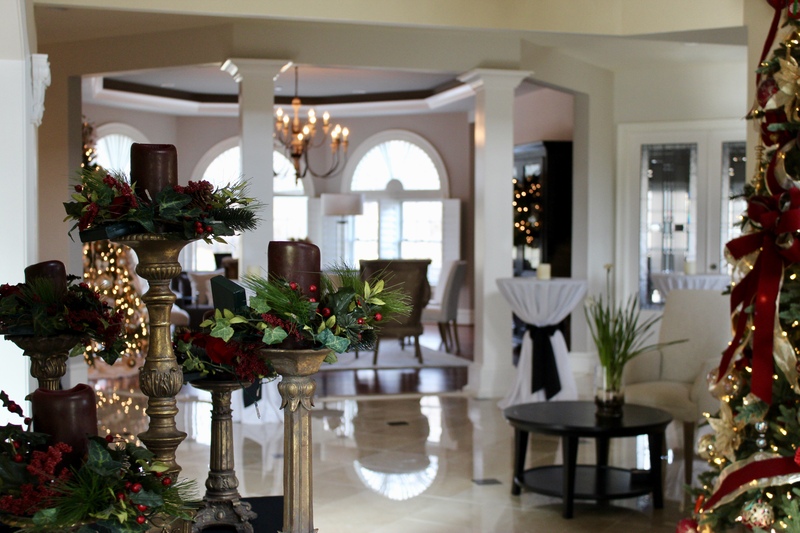 Your home looks perfect for whatever entertaining plans you have in mind during the holidays! Merry Christmas, my creative and talented friend! Thank you Lynn! Entertaining is such fun, I love my friends dearly and love having them over to my home. Have a wonderful holiday with your family and friends Lynn! That’s what entertaining is all about, being together…doesn’t matter the size of the space, the cosier the better 🙂 So glad you enjoyed the post, thanks for stopping by! So much work ahead! But the key is to enjoy the festivities in the moment, clean up will be there whether there is a big event or not, the prep work looks great however, can’t wait to hear the update after the party!